Can i volunteer to translate Pale Moon into PT/BR? The l10n of Pale Moon. Rawr. 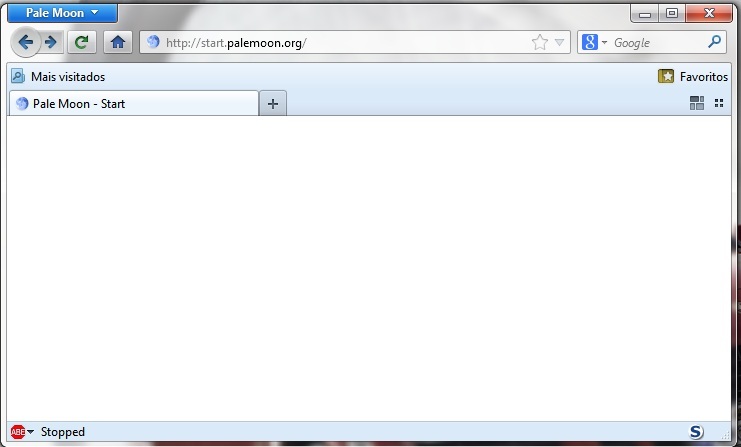 I'm a registered user of Pale Moon which i use for 1 month now & i just love it! It's so much faster than Firefox and i found out that the bookmarks now work as i wanted them to behave & in FF that wasn't the case! I think that Pale Moon deserves to be wide-world distributed and has to grow more famous!!! I discovered it on Majorgeeks! I'm now testing the MailNews 16.0.1 because Thunderbird is also a little bit slow for my taste! Thanks a lot for reading this and thanks for this amazing browser! Re: Can i volunteer to translate Pale Moon into PT/BR? Thanks for your offer! Pale Moon already has a fully completed pt-BR language pack available at http://www.palemoon.org/langpacks.shtml so it's not needed at this time. You can, if you want to, help with a Portuguese translation of the Status Bar options that are still lacking this language. If you're interested in that, let me know. Thanks for your response! I'll inform my friends that the language pack is available and will provide them the link to download it. As for translating the Options bar i'll be very glad to do it so if you want, just tell me what to do (formats for text, etc). I'll always provide both English original and PT/BR translation, in this the PT/BR standard will be used in a "neutral manner" meaning that the translation will be completely comfortable for both PT/BR users & will comply with both countries orthographic & grammar international agreements. Just drop me a line and give me the instructions how to do it and i'll get to work right away! It's a pleasure to give back some work for something as valuable as your browser & mail client is! I'll translate Mailnews options/menu bars also if you want. For the record i'm bilingual since i was 12 years old so i tend to use English for all my programs just for the sake of simplicity but i have also a degree in Portuguese Literature and also speak/write Spanish & French I worked as a text reviewer & english to portuguese translator for years in Edições Asa, a national book publishing/editor company so you'll get the best translation available! Again thank you for this wonderful browser! Today i saw the results of the voting at About.com & Pale Moon is way ahead with 44% of the total votes! It's already a winner!!! Attached to this post are the necessary files for translation (in en-US). The .properties files should have the text after the equal signs translated, items before the equal sign should not be touched. The .dtd files should have the text in quotes translated, and everything else should not be touched. Of course it's preferable if you can keep the length of the translated strings somewhat the same. Make sure to save the resulting files as UTF-8! This is very important. As for MailNews, you can use the Mozilla supplied language packs for thunderbird of the same version to get it in your local language. it may refer to the program as "Thunderbird" in that case, but that's just cosmetic. If possible, if you could have the translation done by tomorrow, I can include it in the upcoming point release. If not, it will be included in the next version. May the Pale Moon new update be another big success! See you soon! For future reference, if you add .txt to it because of your local editor requirements, just add it, don't change the file name otherwise. e.g. make it "meta.properties.txt" not "metaproperties.txt". "active" isn't translated at all, and "paused" doesn't seem to have a singular and plural form. The second should be plural. If there is 1 active download, the first string is used (singular) = "1 Active Download"
I'm very sorry for letting that one slip but it's easy to correct in the next release... In the meantime i'll be evaluating the PT/BR language pack you've provided and will forward you any suggestion. At least i can announce to my PT/BR friends that the next update will have the full Language pack! Thanks for warning me and next time i'll do it during the day time to ensure i'm well awake! Have a good day and please announce the update in MajorGeeks (and if they will let you also on Softpedia, FileHippo, CNET, etc) I'll try my best to lobby a little to have Pale Moon featured on some major freeware sites! Last edited by Kafshiel on 2013-03-09, 17:12, edited 1 time in total. Kafshiel wrote: Have a good day and please announce the update in MajorGeeks (and if they will let you also on Softpedia, FileHippo, CNET, etc) I'll try my best to lobby a little to have Pale Moon featured on some major freeware sites! About FileHippo.com wrote: We do not take software submissions from publishers. The site is user focused, we analyse the software market daily for popular software to add. ....Pity! IMHO FileHippo's layout and list of readily available previous versions is otherwise rather good. I'll have a look later about your other replies re: translation, kind of done now after pushing the release out in a hurry. I trust MajorGeeks, Softpedia, and FileHippo. I want to download an application packed by CNET in their download manager as much as I want a broken leg or an infestation of their toolbars and sundry parasites. 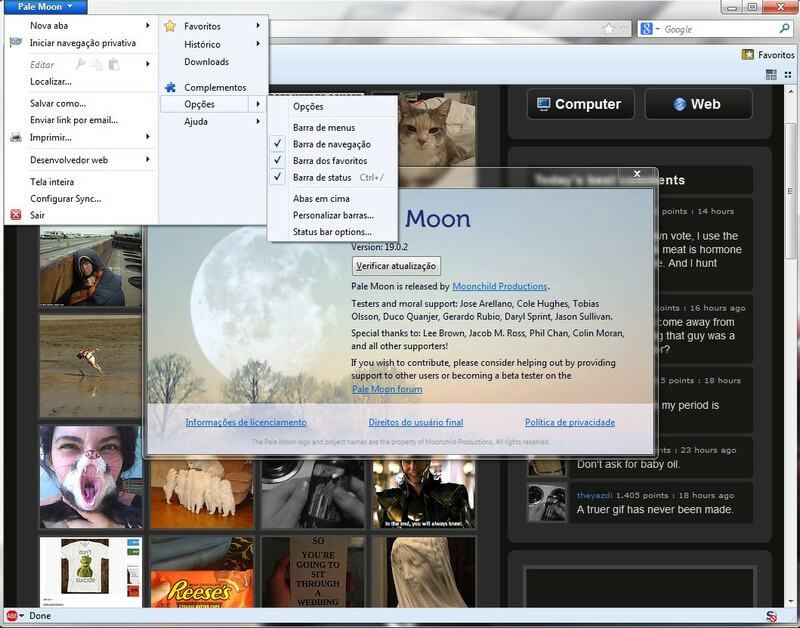 Here are some screenshots of the resulting preferences window. Let me know if anything is incorrect. Also: it's not a big issue if strings are longer, as long as they aren't causing issues with overflowing. The dialog box allows for some wiggle room in most cases. Despite it is look fine, this translation are not really suitable for PT/BR but it is fine for a PT/PT translation. Unlike Portugal, we do not use translated words for most of the tech/internet common terms and words. We do not use LIGAÇÕES for 'Links'. We just say and use the word 'Link/Links'. The same goes for 'status' in an internet 'environment'. Also, here, the computer device called MOUSE is called MOUSE. Nobody in Brazil say RATO for a computer mouse. Also, we do not translate the 'Download' word. Reajustamento - Redimensionamento suits better. Jonatham, thanks for the feedback. I can use the supplied translation for pt-PT, and if you have time you could help with pt-BR instead, if you want? "Done" is translated, but doesn't show in the screenshots - not sure where you got this from? It's translated to "Completo"
Moonchild wrote: Jonatham, thanks for the feedback. Yes, the status bar is not translated yet in the release version of Pale Moon. That is what your Portuguese colleague has been working on! Give me the file, I will try to do it in my spare time. It has the files in the initial post for the status bar. If you think is better to go with Babel type of translations so please do... I really don't have the time to defend native translations... That's not my job anyway I have a final translation of the option file but i haven't sent it since you said you only needed the correction... So the correction is already (1 month now) on my post and i have nothing to change or add to that translation! Surely i'm not gonna advise to use a Web Bot to translate... In that case simply copy Firefox! That said it's sad to see "Jonathans" (It's not a Portuguese name!!!) translating with the same arrogant american "we know it all" attitude that drives Europeans to reject american opinions (Not only on Language i'm afraid...) If i was incorrect in my Translation please consult ANY Portuguese Language Professor as to if my translation was in error! I DON'T Correct USA translations! UK translations i do correct... USA falls under the Banner of "Probabably this person is Illeterate" for 60% of americans So go trust who you want! I will send a new ZIP file of the final Options translation... After that i will trust that americans will translate Portuguese... After all everybody loves USA because they are so respectfull as to other cultures... Yes this is a very sad sad sad joke on USA! This is completely uncalled for, you do realize that, right? Also, you have to realize that the STATUS BAR translation is NOT part of the language pack, it is part of the actual Pale Moon browser downloads - as such any updates to the status bar functionality and preferences window will only be updated along with new browser releases.